Cadillac Eldorado Crash: Fire From Car Accidents.com, Pennsylvania Car Accidents: Fire department arrived to all the windows being blown out and 15' flames shooting up off the car. Fire department arrived to all the windows being blown out and 15' flames shooting up off the car. Not your typical accident, but an accident non the less, this is what a cadillac looks like after shorted wires. This is my 1984 Cadillac Eldorado after it burnt up. This happened in Montgomery, Pa on January 12, 2004. 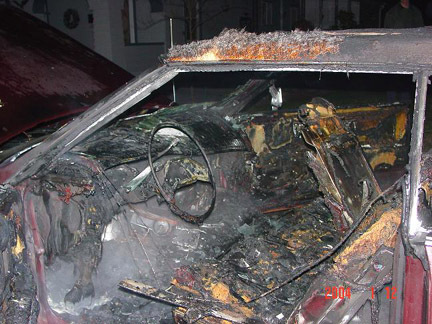 Appeared to be electrical, engine was not burnt at all, inside was totally gutted as you can see from the pictures. Fire department arrived to all the windows being blown out and 15' flames shooting up off the car. Took 5 minutes to put out. I smelled something burning on the way to my sister in laws house, but didn't see flames until after dinner when i went outside for a smoke and there she was just a smokin away. Needless to say, i didnt need to light up, just stood there and inhaled the plastic burning. Thanks for your great site, just wanted to add this to it.